Ugandan artist, Moses Ssali, also known as Bebe Cool has finally said that he is taking a break from social engagements and public performances until further notice. The musician was forced off stage while he was performing at Lugogo Cricket Oval, as a curtain raiser for Jamaican star Tarrus Riley on Friday evening. The crowd then started chanting #FreeBobiWine and throwing stones and bottles at him, forcing Bebe to pause his concert and wait for the crowd to calm down. 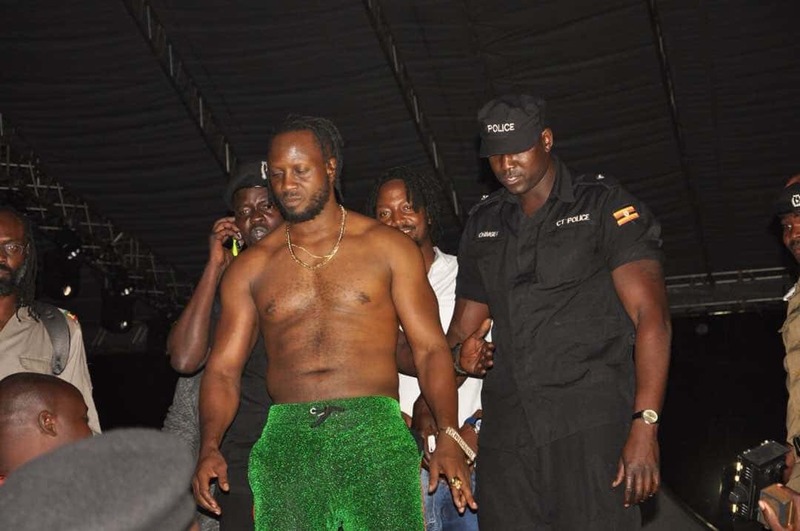 Bebe Cool was forced off the stage by two counter terrorism cops, his son and artist, Hendrik Ssali, when they realized that the crowd was getting wild. In his response, Bebe Cool has said that his music career has enabled him to build a life for himself, his family, friends and many dependents. “The current fruits from this industry would not have existed if Uganda did not have peace, freedom, tranquillity and tolerance for each others’ religious, political and cultural beliefs.” he wrote. Bebe has accused Bobi Wine’s supporters of despising him for his political position. In an interview, Bebe even accused Bobi Wine of seeking attention and faking his torture incidents. Bebe has since decided to take a break from performances until further notice. “For the safety of myself, family, friends and fans, I regrettably would like to announce that I will not be making any public performances until further notice. My prayer is that the current situation in our beloved country doesn’t deteriorate into an unfortunate state. For God and my Country.” his post reads in part.